Ok, so Calgary is having a pretty great season so far right? I mean their 3 points away from leading the entire NHL after going 9-5-2 in their first 16 games, not bad for a team that most people thought would be battling Buffalo for last. Meanwhile the Oilers have 13 pts in their first 15 games and sit just 1 point out of last place in the western conference. Obviously the Flames are a better team right? No, of course not, lets take a deeper look. PDO is found by adding a teams save percentage to a teams shooting percentage and over a large sample size all teams will approach a PDO of 100 or about a .920 save percentage and an 8% shooting percentage. This means that we can use PDO to predict if a team has been getting lucky bounces and will regress or vise versa if a team has been unlucky and will improve. The Calgary flames have a PDO of 103.15 which is the first indication that they’re just not as good as the early standings suggest, they have an above average save percentage (932.5) and an above average shooting percentage (9.91) which will surely regress. The Oilers on the other hand have a PDO of 97.11 on a shooting percentage of 7.16 and a save percentage of .899, both of which are under league average and will surely rebound. So based on PDO its pretty easy to predict that the Oilers will climb in the standings while the Flames will fall in the standings. I’m going to use Corsi for percentage (CF%) to show which team is leading the way on possession. A Corsi event is any shot attempt on goal including blocked shots, missed shots and shots on goal and CF% is the percentage of total Corsi events that were generated by a team. For example if there are 50 shots attempts taken in a game and EDM generated 30 of those attempts then their CF% would be 60% and the opposing team would be 40%. The Calgary Flames have a CF% of 43% so far this season, that means that out of every 100 shot attempts 43 of them have been by Calgary and 57 of them have been against Calgary. The Oilers on the other hand have a CF% of 51.4% which is such a fantastic thing to see after all these years of getting outshot every game. These numbers are a pretty clear indication that the Oilers are the superior possession team and overtime should surpass Calgary in the standings. The Flames have taken 25.69% of their faceoffs in the offensive zone and 36.02% in the defensive zone. Good teams that possess the puck don’t take nearly as many defensive zone faceoffs as the Flames and take many more in the offensive zone. 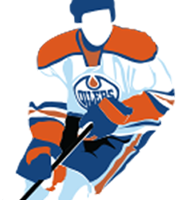 The Oilers on the other hand take 32.66% in the offensive zone and 29.01 in the defensive zone. The Flames have scored 55.2% of the goals in their games so far this season which is really incredible considering they’ve only had 45.6% of the shots. Pretty lucky. The Oilers on the other hand have only scored 41.3% of the goals in their games even though they’ve had 49.7% of the shots. The Oilers are off to a rough start but the underlying numbers indicate that they’re actually playing pretty good hockey and could be fighting for a playoff spot in April. This entry was posted in Analytics on November 10, 2014 by jtunnicliff. So the flames now are 12-6-2 and still one of the hardest working and least skilled teams in the league. I am doubtful they will make the playoffs with the west (and the pacific division for that matter) being as strong as it is but at least they are in the thick of it . Seriously, while I understand that the stats (and for that matter a player by player comparison) may paint a nice picture for the Oil vs. the Flames, the results are still unflattering. I know that there is no stat for heart but if you actually watched both teams play you would see one team inspired to play, working hard game in and game out, while the other still makes the same mistakes they were making the first two weeks of the season. I’m not sure what stat had you predicting the oil fighting for a playoff spot but right now they are two points from the bottom of the league. It is embarrassing! Maybe when comparing these teams look at shot blocks per game, odd man rushes given up, 5 on 5 goals for/against, or power play%. They would all seem to be important stats and might help determine why Calgary is 12 points ahead of the Edmonton (flames with one game in hand) a quarter into the season. The Flames seem to be at least giving their fans some hope while we here in Edmonton have already started looking forward to our next draft pick. Lucky or not the Flames continue to play well as a team while the Oil falter game after game after game. The Oilers finishing behind the flames last year was a joke but this year its more of a sad tragedy. 7+ years of rebuilding only to be one of the worst again. Fighting for a playoff spot in April.. HA…. No stat should have told you that! You make some valid points, and I have to admit that after watching the game last night my confidence in the Oilers is a bit shaken. With all of the Oilers flaws this season I still think they are a better team than Calgary even with their 12-6-2 record. Its only a 20 game stretch and sometimes anomalies like this happen where bad teams go on lucky winning streaks but they just can’t maitain them. Last season for one stretch of 17 games the Oilers had a record of 10-4-3 which is pretty spectacular but they were still a bad team on a hot streak.